Is Jaguar about to square up to the Audi RS6 Avant and Mercedes CLS63 AMG Shooting Brake? 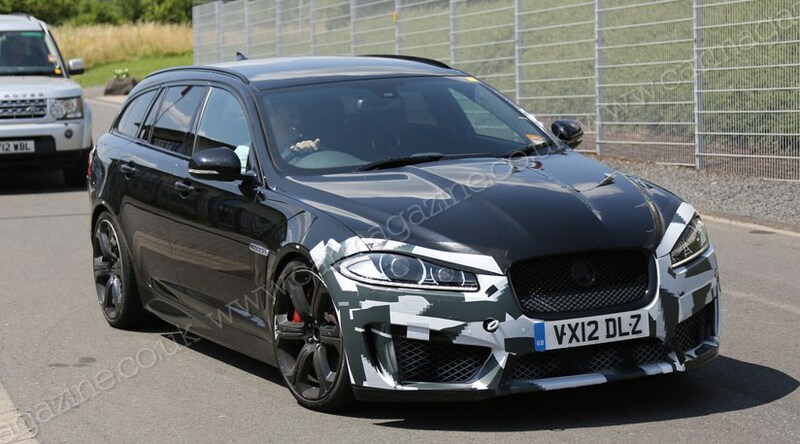 The appearance of a suspiciously athletic looking XF Sportbrake test mule at the Nurburgring shows that the company is toying with its very own super-estate to fight the Germans – the Jaguar XFR-S Sportbrake. So this XF Sportbrake is a bit special then? Spot the clues: there’s new bodywork for a start – the taped-up front bumper is identical to the XFR-S saloon, which gets large front air intakes and a deeper front splitter. This Sportbrake also wears an XFR-S triple-vane rear diffuser, quad tailpipes, and an extended roof spoiler – thankfully not as oversized as the XFR-S saloon’s wing. This test mule is also wearing the XFR-S-style 20in six-spoke alloy wheels, larger brake discs and calipers, and rides lower than the regular XF Sportbrake range. What’s the spec of a Jaguar XFR-S? Under the bonnet, the XFR-S uses a 5.0-litre V8, supercharged for 542bhp and 502lb ft and channelled through an eight-speed automatic gearbox. It’ll hit 62mph in 4.4sec, top out at an artificially limited 186mph, and costs £79,995. The current Sportbrake weighs 105kg more than the XF saloon, so expect a high-performance model to take a shade longer in the run from 0-62mph. Is Jaguar really going to slot its 542bhp V8 into an XF estate? You bet – there’s a host of fast estates packing serious power currently on sale, like the 444bhp Audi RS4 through to the 549bhp Mercedes E63 AMG Performance Pack. A Jaguar estate with 542bhp would be right at home in this sort of company. There’s also been a recent trend of power-laden, pricey specials. Remember Volvo’s 500bhp S60 Polestar, made as a £300k one-off for an American buyer and then offered as a 15-car limited run series? And then there’s the Nissan Juke-R, which went from engineering skunkworks PR stunt to a 20-car, 542bhp hero costing a massive £400,000. Yet the business case for a mega-power estate in crucial foreign markets, like the US, is pricklier. Key rival Audi doesn’t offer its RS Avant models in the US, and Cadillac has recently dropped the 565bhp CTS-V estate from its range, leaving only the coupe and saloon still on sale. BMW, meanwhile, no longer builds an M5 Touring, after the previous V10 version’s disappointing sales. So it’s just a plaything for Jaguar’s Nurburgring test centre engineers? No – Jaguar doesn’t make test mules like this just for kicks. So you’re looking at a near production ready test mule that should arrive in showrooms as early as next year if given the final nod. While the potential market for the XFR-S Sportbrake is small, the flagship model could serve as a halo car for the Sportbrake, adding to its appeal and credibility while prompting interest in the more affordable diesel model, the sole Sportbrake currently on offer. If the Jaguar XFR-S is signed off it’ll be the most expensive XF model on sale, at around £82,000.